Delicious peas are coated with olive oil, mingled with fresh juicy tomatoes and flavored with sweet onions and fresh dill to form an amazing vegetarian dish. This classic Greek peas and potato stew recipe is a traditional Greek dish, that is one of the brightest examples of how Greek cuisine takes the simplest ingredients and transforms them effortlessly into a finger licking dish! Some tips to make the perfect traditional Greek peas (Arakas laderos) every single time! Greek peas and potato stew (Arakas laderos) is a traditional Greek recipe which falls under the category of Greek dishes called “Ladera”, meaning dishes prepared only with olive oil, with no addition of other fat. So make sure to use some good quality extra virgin olive oil, which will definitely lift the flavour. One can find many variations of this traditional Greek dish, with the most popular being this classic version of peas and potato stew with carrots in a tomato sauce. A very common mistake made when preparing this “Arakas laderos” dish is the amount of water used. Make sure to add just enough water to boil your ingredients and not too much. The water needs to evaporate so that peas and potatoes remain with their oily sauce, that shouldn’t be watery. Make sure to use the ripest tomatoes you can find for a juicier and sweet sauce. Sauté the red onions to allow their flavors and aromas to come out. Enjoy this simply delicious, extra comforting Greek peas and potato stew (arakas laderos) with crumbled feta cheese on top and crusty bread to mop up every single drop of that delicious sauce! Oh and you can always read this delicious recipe in Greek here Αρακάς λαδερός. 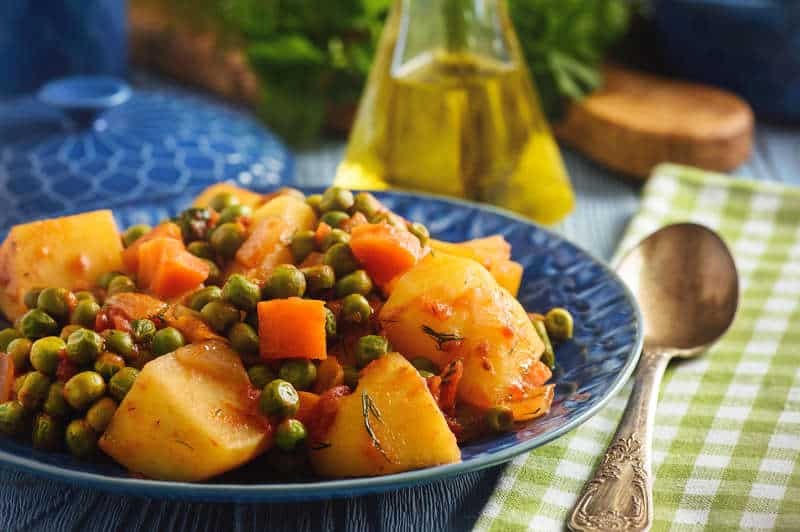 To prepare this delicious Greek peas and potatoes recipe (Arakas laderos), heat half the olive oil in a medium sized pot. Sauté the red onions and fresh onions until soft. Add carrots, potatoes and tomato puree and sauté 2 more minutes. Add the grated tomatoes and enough hot water so that the ingredients are covered just a bit. Bring to a boil and boil for 15 minutes (without the lid), until the potatoes have softened a bit. Add the peas, fresh dill and the remaining olive oil and season well with salt and pepper. Serve at room temperature with crumbled feta cheese and crusty bread.